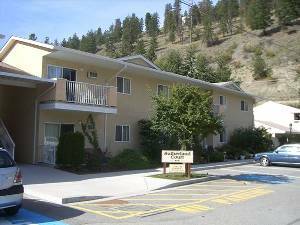 In the late 1970�s, a group of concerned citizens formed a Society with the aim of building a place where older Peachland residents could live when no longer able to manage in their own homes. 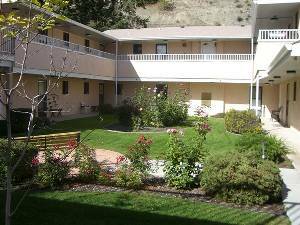 After much hard work at fund raising (in fact some even mortgaged their own homes), and with the aid of BC Housing, Alexandra Court came into existence with 10 rental units in 1982 for those 55 years of age and over. It soon became apparent that more units were needed, and in 2000, Sutherland Court was opened with 23 more suites. It was named after Earl Sutherland, a long time President of the Society who was one of the proponents of the plan for a second complex. 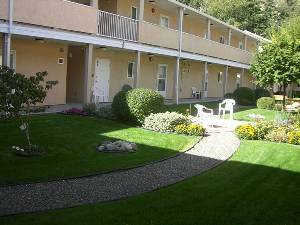 Alexandra Court�s mortgage was paid off in 2007, and BC Housing subsidy ceased but rents are still affordable. Suites vary from 485 to 570 square feet. Rent ranges from $570 to $770 and includes heat, electricity, cablevision and laundry facilities. Some tenants may qualify for rental assistance through the SAFER program. All units are air-conditioned and there is elevator access to the second floor. There is no provision for wheelchair access, nor is there a live-in manager, therefore tenants must be able to live independently. 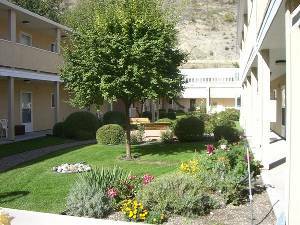 The units are on level ground, and a short walking distance to shopping: pharmacy, doctor, dentist, grocery store, the local 50+ Activity Centre and the Peachland Recreation Centre. Access to the lake with its foreshore beauty is less than a block away.